Of late, I've found myself repeating old mistakes and relearning old lessons when it comes to my shopping habits and life choices. Ever so often I try to reinvent myself and my looks by veering off into the realm of clothes and looks that are more aspirational than realistic. I'm falling into that mode again and it's time to pull myself out by looking at my history and using it to plan my future wardrobe needs. How's that going? Easy but not fun. I bought everything in this picture in the span of 1 week in 2016. 3 years later, the handbag is the only item I still own. The shoes were all donated because I DON'T WEAR HEELS! So I need to write them down once and for all and maybe stop falling so hard for the same crap all the time. Pants, Fabric: I hate sorting laundry. Skip wool! In my 2 month foray into the world of thrifting, I broke all of these rules and the buyer's remorse is real in these parts. 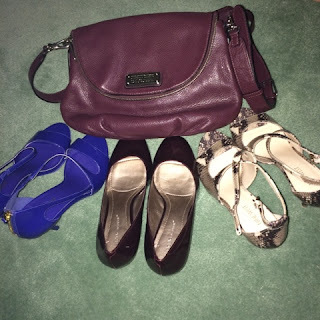 Blogging about what I've spent and bought makes me embarrassed and accountable. I need to DO ME because trying to be something I'm not is freaking expensive!